GUESS?, Inc. Partners with Alipay to Simplify Payment Experience for Chinese Travelers Visiting the U.S. | Guess, Inc.
Home News Releases GUESS?, Inc. Partners with Alipay to Simplify Payment Experience for Chinese Travelers Visiting the U.S. GUESS?, Inc. Partners with Alipay to Simplify Payment Experience for Chinese Travelers Visiting the U.S.
NEW YORK--(BUSINESS WIRE)--Jul. 24, 2018-- GUESS?, Inc. (NYSE: GES), the global lifestyle brand and retailer, announced today a partnership with Alipay, the world’s leading digital payment platform, operated by Ant Financial Services Group. Through the partnership, Chinese travelers visiting the U.S. will be able to pay using the Alipay app when making purchases at more than 50 GUESS stores in popular destinations including New York, Las Vegas and California. Alipay is China’s leading digital payment provider and the primary means of online and mobile payment for consumers in China. Now, Chinese travelers visiting GUESS stores in the U.S. will be able to use their Alipay Mobile Wallet to enjoy the same convenient, seamless and secure payment experience that they are familiar with from home. 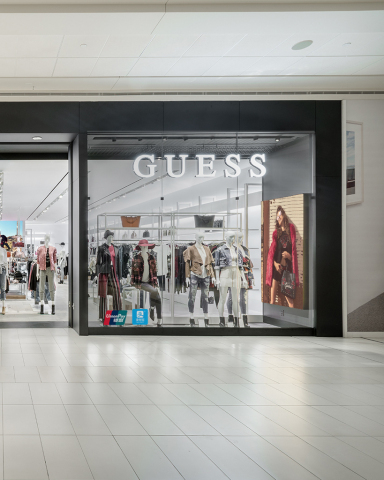 Through the partnership, Alipay will be available in selected U.S. stores across all GUESS concepts, including GUESS, GUESS Accessories, GUESS Factory, Marciano and GbG. Through Alipay’s geolocation-based “Discover” function and push notifications within the app, Chinese travelers can locate nearby GUESS stores, receive promotional information and make purchasing decisions. The service also enables local stores to better target and connect with Chinese consumers. GUESS will be able to market to Chinese tourists before, during and after their visits to the U.S., boosting its brand among the rapidly expanding group of Chinese overseas visitors. Operated by Ant Financial Services Group, Alipay is the world’s leading mobile and online payment platform. Launched in 2004, Alipay currently works with over 200 domestic financial institution partners. Over the years, Alipay has evolved from a digital wallet to a lifestyle enabler. Users can hail a taxi, book a hotel, buy movie tickets, pay utility bills, make appointments with doctors, or purchase wealth management products directly from within the app. In addition to online payments, Alipay is expanding to in-store offline payments both inside and outside of China. Over 40 million brick-and-mortar merchants now accept Alipay across China. Alipay’s in-store payment service covers over 40 countries and regions across the world, and tax reimbursement via Alipay is supported in 29 countries and regions. Alipay works with over 250 overseas financial institutions and payment solution providers to enable cross-border payments for Chinese travelling overseas and overseas customers who purchase products from Chinese e-commerce sites. Alipay currently supports 27 currencies. Established in 1981, GUESS began as a jeans company and has since successfully grown into a global lifestyle brand. Guess?, Inc. designs, markets, distributes and licenses a lifestyle collection of contemporary apparel, denim, handbags, watches, footwear and other related consumer products. Guess? products are distributed through branded Guess? stores as well as better department and specialty stores around the world. As of May 5, 2018, the Company directly operated 1,020 retail stores in the Americas, Europe and Asia. The Company’s licensees and distributors operated 624 additional retail stores worldwide. As of May 5, 2018, the Company and its licensees and distributors operated in approximately 100 countries worldwide. For more information about the Company, please visit www.guess.com.